Over the years I have created a lot of files, taken thousands of photos, saved countless images and PDFs, and bought or converted dozens of music albums. I have several internal hard drives, but wanted a compact high-capacity external hard drive for backup purposes. Western Digital’s My Passport hard drives are compact enough to travel, but I chose this line for the simplicity in connecting them to my PC. They connect to a single USB 3.0 port (and are backwards compatible to USB 2.0), and require no external power. Plus their smaller size makes them easy to stow away in a drawer or any off-site location. 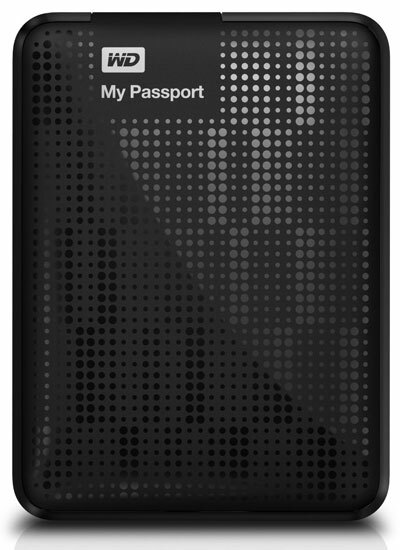 I bought two WD My Passport 2TB drives from Amazon, one in November 2012 and another in February 2013, and have been using them since then. The hard drives themselves are not bleeding-edge fast, but they’re speedy enough for backup purposes. I’m sure there are plenty of benchmarks around if you want to see how these drives compare to common internal drives. My understanding is that the hard drives used in these enclosures, at least the 2TB ones, are a special size developed by Western Digital. In other words, they’ll be too big to insert into a laptop or other standard 2.5″ hard drive dock or bay. Size-wise, my 2TB drives are thicker but shorter (length-wise), compared to a bare-bones Vantec 2.5″ enclosure I have laying around. I really have nothing but good things to say about this hard drive. Looking at the overwhelmingly positive reviews for the family drives on Amazon, most other users feel the same. I don’t use automatic backup software, but one day might. Windows can also handle automatic backups as well. You can use these drives for Mac computers, but you have to reformat the drive first. Thus far the drives both seem to be reliable, but time will tell. Bottom-line, the 2TB drive offers massive storage space, has a speedy USB 3.0 interface, and is compact enough to slip into a pocket. It’s affordably priced at about $150. 1Tb and 1.5TB drives are also available. I would absolutely buy more of these drives if I needed additional backup space. Note: the 2TB hard drives register in the computer as having 1.81TB of free space. The drives come with some preinstalled programs that I opted not to use – I just moved the whole lot into a “preinstalled stuff” folder just in case I want to use them in the future. I looked long and hard at this one before ultimately buying the WD 2T My Studio drive. It’s a metal enclosed desk version. My ultimate choice in the My Studio came down to (i) availability of FireWire 800 configuration, and (ii) my MBP doesn’t have USB 3. I do have ThunderBolt connectivity, but can’t justify the extreme premium for a ThunderBolt HD just for personal backups. I would agree that the My Book Studio seems like a good choice for Mac right out of the box. The ThunderBolt versions look good too, but for the same price a NAS box seems like a better choice since they offer greater control. But like you, I don’t really need a ton of bells and whistles just for what I plan to back up. I flip-flopped for a few days, considering a NAS box that I would fill with WD Red Caviar drives, a desktop external HD like the WD My Book, and the Passport. Ultimately, two things convinced me to go for the Passports over desktop versions – the smaller size of the Passports and how the smaller drives only need USB power to operate. Full size external drives typically need to be plugged into a wall outlet. Some might come with an extra USB plug that’s wired just for power, but I have only seen this with some 2.5″ enclosures. I agree the best thing about the Passport line is that they are powered by the USB cable. Back-up and put in desk drawer.